Last weekend I decided to get on the train and visit Herne Hill. Previously, I’d agonised over how to walk there from Brixton Tube station knowing I’d probably get lost. I then realised that from where I live – St Albans, I simply have to stay on the train past where I’d usually disembark in London. On a weekend the cost is only £10.10 with First Capital Connect. I know a lot of north London and work for a central London Council. Going deep into south London is a voyage into the unknown for me. I’ve driven from Vauxhall Bridge Road in Westminster across the river to Elephant & Castle before. In my mind, everything simply plunges off a waterfall after that. When the train crossed the Thames and the built environment just carried on, it caused genuine excitement. Herne Hill belongs to the Manor of Milkwell. That title – seemingly out of a Thomas Hardy novel – is so warm and nurturing. Surely the folk in Milkwell know how to brew well too. That’s what I was counting on when I planned this trip. 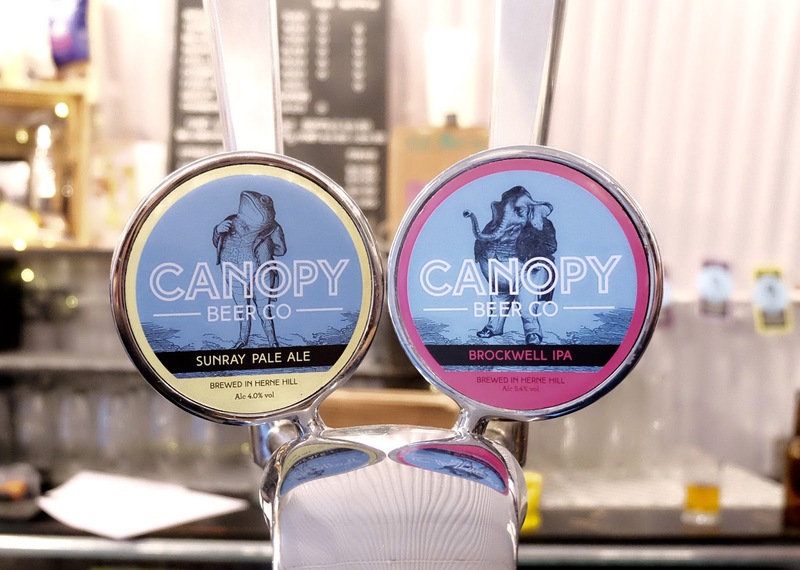 From the station, Canopy Beer Co and Bullfinch are the easiest two breweries to find in London. You exit Herne Hill station (there’s only one exit – an added bonus! ), turn left so you see Brockwell Park, cross the road to follow the railway buildings on Norwood Road and walk for about a minute until you see the sandwich board. You’re at the first of the two tap rooms! 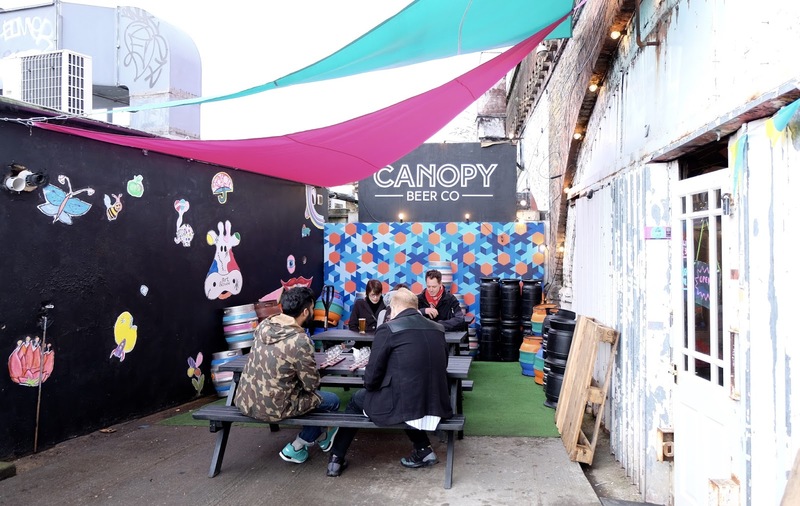 The Canopy Beer Company in the best possible way has a jumble sale feel to it. It also reminds me a bit of a creche with the primary colours and fabrics. Curtains, canvas, astroturf, fairy lights, empty key kegs hanging like balloons and mismatched furniture make me feel like a child discovering a den in a primary school. I love it. Their brewing capacity is 4 barrels on average 5 times per week. I started the session with their take on a Kolsch which they’ve candidly named as such too (it has Protected Geographical Indication and is guarded by Kolsch Convention stormtroopers in Cologne). Champion Kolsch’s badge is ice blue with what I believe to be a suited penguin. The beer reminds me of fruit peelings and is cool when it hits the tongue and well carbonated. There’s a grassy hoppy aroma. Hopefully it’ll be back in summer when it’s needed the most. It was a good opener. 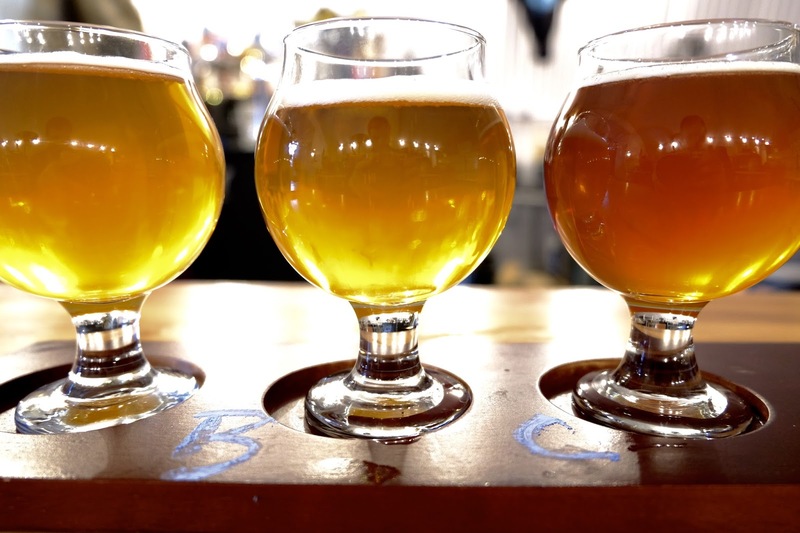 The brewery is currently looking for an additional IPA for its permanent range and have struck upon a fantastic idea: let the consumer have a flight of four potential candidates for immediate feedback. I consider myself a verreophile (a glass freak) and was smitten by what can only be referred to as a row of ale buds or beer baubles – the cutest glassware I’ve ever seen. Each holds a quarter pint. Squeal! 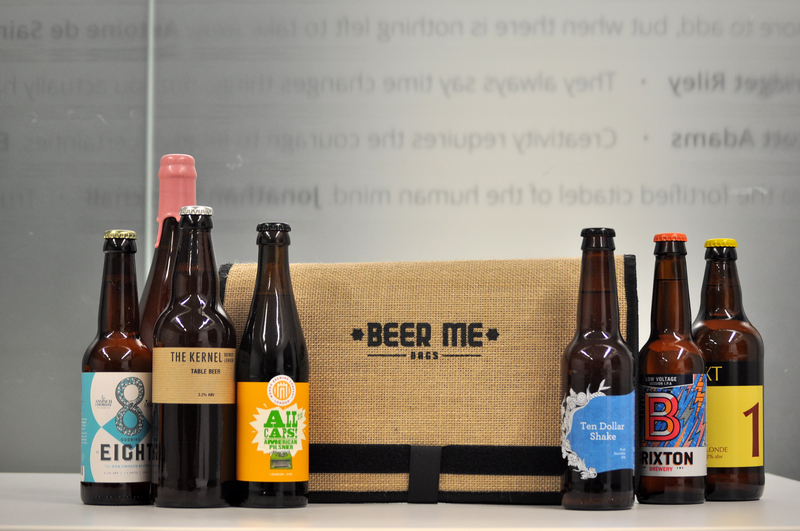 The potential IPA additions were labelled A,B,C and D and the following notes are deliberately in the wrong order. 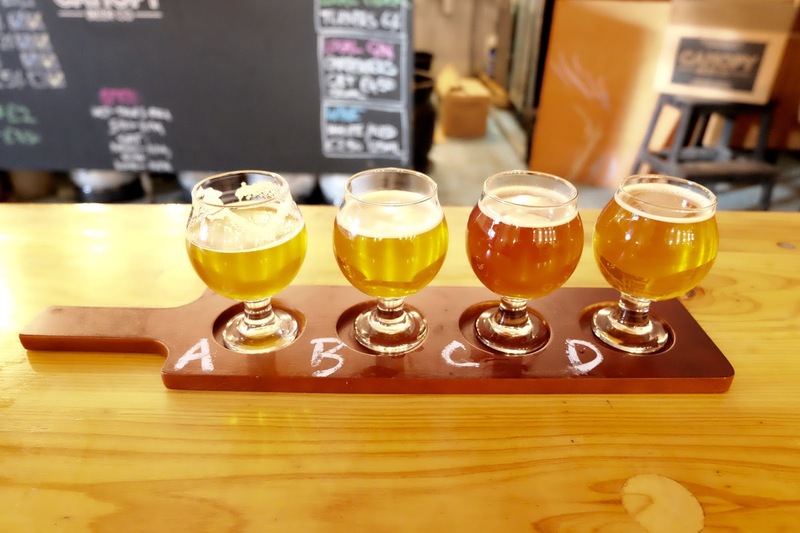 To have the experience, you’ll just have to get yourself down to the Canopy tap room and drink the flight yourself. In a mixed-up order, the first was dark amber with a musty aroma like you might expect from a more traditionally British IPA. No high citrus notes. It was strong and controlling and could easily masquerade either as a strong bitter like Fuller’s ESB or even a German Alt. The richness clung to the top of the palate and throbbed there. I thought the ABV might be quite high on this (I found out later it wasn’t – it just came across as heavy-handed). The next beer had a light breezy pineapple and peach aroma. It was pale amber in colour. I got a very smooth silky mouthfeel. Fruit salad juices were awash on the tongue. It did bitter up after a few minutes but on the whole, one of the fruitiest beers I’ve tasted. Spiritually, it was more of a fruit cordial and too easy going for me to think of it as an IPA, tasty though it was. “Number three” was a liquid with no discernible aroma. On the tongue it was fruity & easy. It even reminded me of the Champion Kolsch. The mouthfeel was a little milky and it was the lightest of the four beers. It didn’t really have an IPA’s weight. Conclusion: it got away with the P and A but not the I in IPA. Finally, a blazing oak-hued ale – beautiful to the eye. It didn’t impart a loud aroma but I got dark/red berries like you might discern from Bramling Cross hops. This one was thick-souled, resinous and tangy with a touch of Earl Grey tea to boot. Bodily, it was quite cakey and the aroma became Brandy-like. In short, it was my favourite. I’ve always found that taste and preference is completely subjective but I was surprised to hear that a group of women debating their own flights on the next table were rounding on the same conclusion as mine. When I gave my verdict at the bar, it was confirmed as the most common preference and so looks to become the new India Pale Ale soon. I was about to leave but I noticed that a beer had been recommended for Tryanuary on the board so I let it bend my arm. Milkwood Amber Ale is a 7.2 ABV light orange & slightly hazy beer. It had spirity esters, tropical fruit juice and produced a blush of alcohol to the cheeks. Clementines & apricots blossomed on the palate. It was a warm nourishing linctus for the cold weather. On tap there was also a porter, a pale ale and a wheat beer but I needed to spread the booze out to last both breweries. A quick visit to the smallest gents I’ve ever been in and I was on my way. Fortunately, the second tap room was as easy to find as the first. 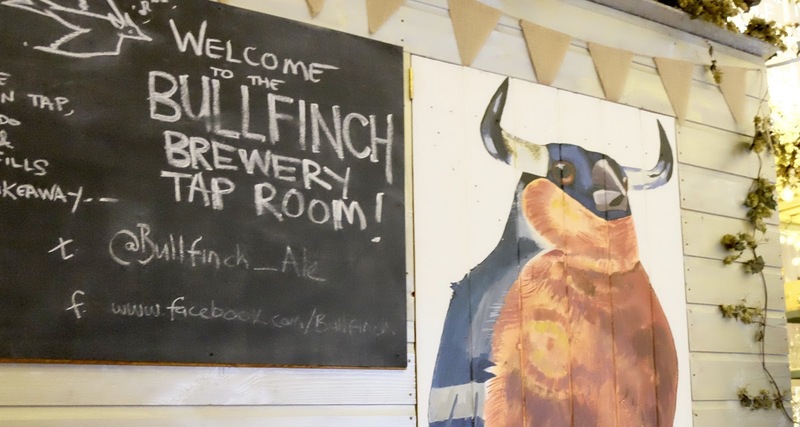 Bullfinch Brewery is actually inside the section of railway bridge that abuts against the railway arch the cars drive under. I missed the entrance at first – a narrow door in the corrugated iron frontage with plastic fly strips. You push through and find yourself blinking in Santa’s grotto. The room is dark, illuminated by candles on the tables and fairy lights suspended from the high ceiling. The punters already installed can’t help but stare at you like you’ve just stumbled into their opium den. There is a built-in bar rather than the open plan one Canopy has and it reminds me of a back-lit NAAFI serving hatch. The brewing capacity at the new venue is 5 barrels twice per week. I settle in for my first Bullfinch beer in a long time. I did know their beers from when they shared premises with Anspach & Hobday on Druid Street in Bermondsey. It seems to me a lot of cloudiness has been sorted since then. The light-coloured beers were much clearer. Black Wolf Black IPA was my first re-introduction and is everything you could want from the style: black fruit pastilles bleed their juices, roast coffee granules smoulder on the inhale with a squeeze of citrus juice for sharpness. It has levity – the carbonation balances what’s otherwise quite an oppressive ale. The dark side is coffee creme, the light side zinging Victorian lemonade. 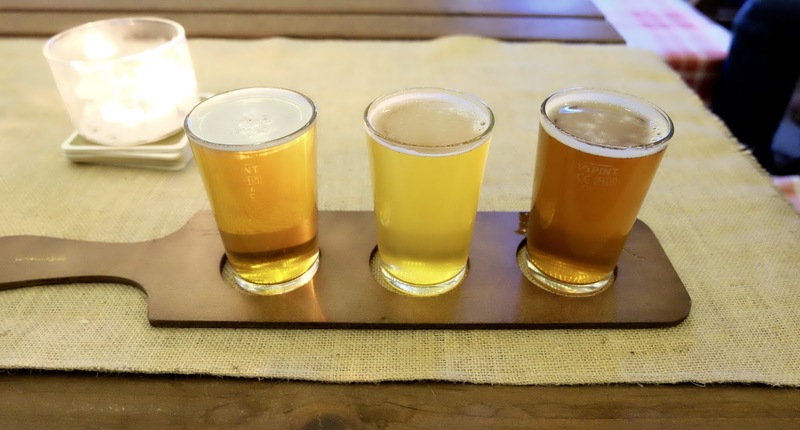 This is the day for tasting flights so I go for one of theirs (Canopy win as far as glassware is concerned here – Bullfinch employs the standard straight glasses). I opt for their Rypa – the beer I most associate with Bullfinch. Next to it Milou – a Saison and then their Rosendale Bitter – the only of the trio on cask. Again, the Rypa (5.8 ABV) has much more clarity than I remember from their original haunt. It digs deep – dark amber, profound and resinous from the rye malt. A touch of pepper on the initial taste followed by a candy sweetness. It’s sticky, tangy and dry like a fruit punch. The Saison (6 ABV) is more elegant. It’s a pale yellow. I get a hint of elderflower or vanilla on the nose. It’s well carbonated and the most refreshing of the three beers. Overall, it has a vague almond profile too. The Rosendale Bitter (4 ABV and named after Rosendale Road where the brewery is situated) doesn’t smack quite as hard as the others but this is often the case when you mix the coolness & front-of-house carbonation of key keg with the comparative gentility of cask. It’s light amber with a hint of apple & white grape. It doesn’t come across as chewily bitter (but the after the Black Wolf, it couldn’t possibly). I could feel my limit being reached, and as I hate waking up on the train in Bedford, I was ready for my last beer. Wolf is an American pale ale (5.8 ABV on key keg). It’s a hazy amber and has a milky consistency with a butterscotch dimension. I get mouthfuls of satsumas and apricots. After a while, the malt does come through to temper the piercing fruit edges. The coolness makes me think of orange ice lollies and glace cherries too. It’s a bouncy castle of new world hops. 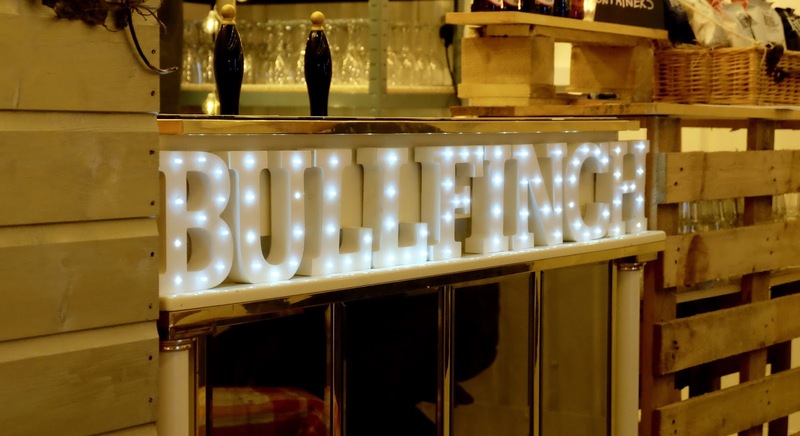 In both tap rooms things shook, rattled and tinkled as trains rumbled over the their roofs – a phenomenon I’m increasingly associating with tap rooms in London. Currently, there are around 20 breweries under railway arches in the capital. Another ten or so are within shaking distance of locomotives. I skirted around Brockwell Park on the way back to the station. I’d like to investigate it when there’s more daylight. I’d also like to visit The Half Moon Pub to see its amazing interior. It’ll hopefully reopen in summer now it’s been saved by Fullers from becoming residential flats. Herne Hill’s a fantastic place to visit. I urge everyone on the First Capital Connect line to take a day trip to the Manor and do the short brewery shuttle. Canopy and Bullfinch are so close to the station and to each other – it’s so utterly stress-free and good ale abounds. To all inhabitants of Herne Hill, I would also urge you to make a day trip to St Albans where I could show you around the best of its 50-odd pubs. In either direction, £10.10 is a good value day out (beer not included). Thanks my friend for these great reviews about this place. I was just making a list of the best party venues for my daughter and found this brilliant post. I really like the place and would love to host my engagement party at this place. Best of luck with it Zerry. The park at Herne Hill would be gorgeous with some nice weather too.